Dominion: What does it mean? - Forum | Wake up, Meeples! Forum breadcrumbs - You are here:ForumBlog articles: Published Articles DiscussionDominion: What does it mean? As a content creator, specifically as someone whose content revolves around talking about Dominion at this point, it's important to me to be able to speak clearly and be understood. It's also important for me to follow what all communities I have access to are saying about the game, even if I don't choose to directly engage. I want to make sure I'm giving the best commentary possible, but also make it accessible to anyone who could be listening or reading. A while ago I did a survey on the community's use of the word "engine" as it applies to Dominion. What sparked this was the fact that I wasn't ever able to communicate what I meant when I used the word to someone who didn't already know what it meant, and I wanted to see if there was some kind of clarity, or more accepted definition or focus that I could latch onto. So I posted about the results and over the last year or so I've been trying to figure out how to reconcile the fact that I don't think the term "engine" is useful for me in spite of the fact that many people still choose to use it. I think I've arrived at the idea that the word is OK to use in the context of describing a certain deck, as long as the deck is adequately described in other ways, and then labeled as an "engine" for ease of discussion. Talking about "engines" as a class or archetype of deck isn't useful because it's not clear what that means, and the best analog I have found for discussion is the distinction between drawing your deck and not drawing your deck. During that time, I've tried to pay close attention to the language I use and that other people use and find other words that may or may not have accepted meanings and try to adjust the way I talk about Dominion to be clearer. I made a second poll asking about three terms, and the results are in. I feel like I owe it to the people who kindly filled out the survey to show them that it wasn't for nothing. If you don't like the data, well sorry, it's just data. If you don't like my conclusions or interpretations of the data, you're entitled to disagree. In fact I've had many constructive conversations in the past about the "engine" survey from people who disagreed, and that has shaped the way I now talk about the game. I'm hoping the same thing happens here, and I believe the process has already started. So let's get to the results and see what we can learn. I'll address each question separately, but I'll start by linking the raw data spreadsheet and posting the composite image of the results before going into more detail. The survey had about 40 responses for each question, and every response that appeared more than once got a category that can be seen in the image below. This is a word that has been used in many different contexts throughout a few different games. I had an idea of a few different ways it could apply to Dominion and I had heard a few different things, but I wanted to see what people really meant by "swingy" when they were talking about Dominion. The results were actually more unified than I thought they would be, and there is a narrative to how a few terms fit together here that seems to be clear enough and somewhat educational. A majority of the responses referenced two main concepts. First, that swingy cards had a component of luck, or some factor outside of the player's control; and second, that the difference in outcomes between the best result and the worst result, based on this luck component, was large. So a swingy card could be great or awful for you (or anywhere in between), and you won't know which it is until you've invested some resources into buying and playing the card. There are two other responses on the list. "Powerful" may have originally referenced other games where swingy cards could provide turns where a player who was behind could "swing" the game into their favor, but in Dominion it stands to reason that any card that doesn't at least have the potential upside of being very powerful for its best outcomes won't be such a large force on the game, even if it is swingy as referenced by the other definitions above. It also stands to reason that if powerful cards have large random effects, that it could result in luck determining more of the outcome of the game than normal, as opposed to skill. While this is a logical consequence of the rest of these categories, the fact that it isn't well-represented in this poll is probably because I see this more commonly referred to as "high luck" or "low skill" cards rather than "swingy" cards. In fact, there are metrics that can be used to measure the skill component of card over a large set of games -- you simply see how well the leaderboard could predict the winner of a given game of Dominion, and see which cards are involved more often when the game result doesn't match what the leaderboard predicts. Current data from online games has been used to calculate this, but unfortunately due to a technical limitation of the online client, only games including players from the very top of the leaderboard (a small fraction of the total games played online) have their games included in this data, and the bias in this data calls the accuracy of these statistics into question. But as far as "swingy" goes, it seems we at least have a narrative here and some language that can be understood by just about everyone without too much confusion. Hooray! Going into this I had my own way of looking at cycling -- we had done a podcast episode where we labeled "cycling" as something specific -- anything that helps you play your best cards more often -- but of course it wasn't a universally accepted term. I wanted to get some hard data on what people think of when they think of cycling, even though I had a pretty good idea of what to expect from the results. 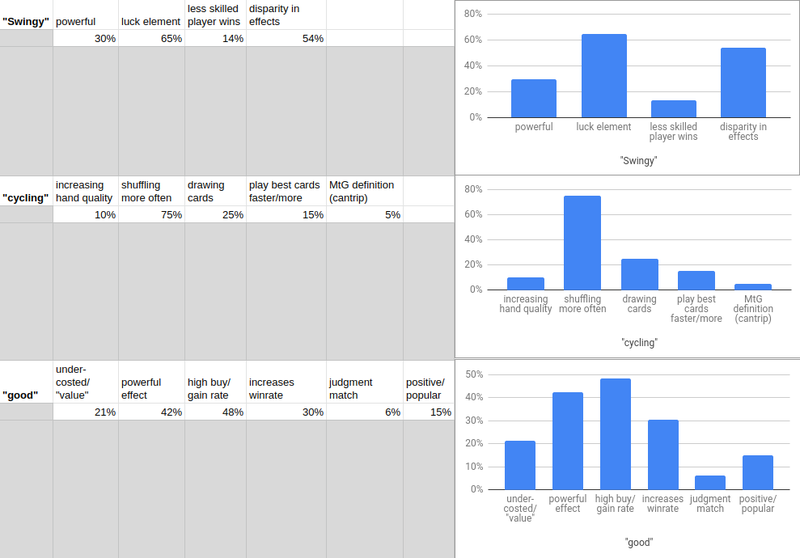 My expectation was that in most peoples' minds, cycling was tied to the effect of moving cards from your deck to your discard, which is equivalent to shuffling more often, and indeed the data supports this with 3 out of every 4 answers specifically mentioning this effect. It's not that I'm terribly surprised to see this, but it does mean a few things to me personally, in that it will probably affect the way I speak about these ideas moving forward. The reason I wanted to use "cycling" to mean what I had was because I found it more educational to focus more on the "why" rather than the "what" of the matter. There have been discussions around what constitutes "good cycling" and "bad cycling" and I've seen these concepts cause confusion in people who can easily lose focus on the overall goal. It's similar to my issues with the way "PPR" is presented. Memorizing effects and lists of situations/exceptions where those effects can be good or bad is not a good way to internalize a concept; explaining the goal and inviting the listener/reader to take in the situation and figure out the answer for themselves is not only a more approachable concept, but it's more directly relevant to real games of Dominion, so it's not surprising how much success I've had using this method. Given this data, though, it seems that I can do better in clarifying my message by using a word other than "cycling" to get my point across. It seems that within the Dominion community, the definition of "cycling" is standardized to the point where trying to assign a different viewpoint or definition to the conversation around that word can potentially be more difficult than it has to be. On top of that, other card games use "cycle" or similar things as keywords, which have a somewhat easy analog to this concept in Dominion of shuffling more often, so I think it's best to try not to step on that. The solution for me is to find another term to use for this concept. While I haven't figured out exactly what it should be yet, once I find that term it should be clearer what I'm talking about, which is the real goal here. I've been doing card ratings for a while, and after all this time it's been pretty clear to me that I haven't seen a universally accepted way people have for determining if Dominion cards are "good" or "strong" -- I haven't even come across anything that's even internally consistent unless it doesn't have much bearing on real games of Dominion. This is pretty similar to the way I felt about using the word "engine" in the past, but I was hoping that the poll for this term would either show a few things that are more prominent, or at least spark some discussion on some things that work or won't work. The data doesn't show anything that's very clear. There are a few metrics that can potentially be helpful in a card's effect on win rate or gain rate, and these can at least theoretically be calculated without bias; but unfortunately due to current technical limitations, it's not possible to get enough data to get good numbers here and I don't think it ever will be. It's also clear that this isn't the full picture and that the problem is much bigger. There are subjective ways of looking at what cards do, and there are many different ways of weighting different statistics that could lead to different results. I'm not sure that the data by itself is enlightening of anything (other than that it reaffirms my belief that conclusions based on card ratings should be viewed extremely skeptically) but hopefully something more educational can come from discussing these results. For example, discussions after the "engine" poll revealed to me that the main relevant distinction to be found is whether or not a player is drawing their deck. This helped to put many things in perspective, including separate concepts that were at least clearer to me. Hopefully something similar can be done with the results of this poll too. What would be your definition of "deck control"? Whenever you say it in the podcast I assume you're talking about being able to play your payload cards more often. So if you're looking for a term other than "cycling" to describe this concept then what's wrong with just using "deck control"? Or have I misunderstood exactly what you mean by that term? These two draft videos (with my previous definition of "cycling") outline that if you're interested. They're going to replace some parts of the video tutorial series (and I'll be remaking them with an updated term instead of "cycling" at the very least) so feedback is welcome. Thanks, Adam. That's really interesting. Since this article is about the definitions of terms we use when talking about the game, I'm going to take the opportunity to make some comments on your definition of a village: "something that allows you to play more than one terminal action in a turn". Overall I like this definition, and it's clearly better than just defining it as anything that gives more +Actions or Villager tokens than it takes to play it, but I have two slight quibbles with it. The first is that it begs the question of what you mean by a terminal action. Is Cultist terminal? If so, then by your definition it's also a village. Imagine Cultist didn't have the "You may play a Cultist from your hand" part but had +1 Action instead. It seems bizarre to define "village" in such a way that the real Cultist meets the definition but my made-up version, which is a strictly better card, does not. Other cards like Vassal are similar, in that if you define them as terminal then they're also villages, but if you don't then they're not. Even Bard is technically a village unless you treat it as non-terminal, which seems unhelpful in other ways. These problems go away if you just replace "terminal action" with "Mountebank" in your definition of a village. Then Vassal, Cultist and Bard can be safely classified as terminal non-villages, which is where I think they belong, whereas Herald and Conclave still make the cut as villages, which they obviously should. I also question whether it's helpful to count cards like Tactician and Patron as villages given that they give you an extra action for the future only at the expense of costing you an action when you play them. Strictly speaking they do allow you to play more than one terminal in a single turn, but they don't allow you to play more than one terminal per turn on average and so don't really do what we generally require in a deck that needs villages. Granted, it is theoretically possible to build to a Bridge megaturn with Patron as the only village on the board, but good luck doing that without playing your Bridges or other terminals while you build. Putting these suggestions together, I present the following alternative definition: card (or card-shaped object) X has the "village effect" if in a 2-card kingdom with X and Mountebank it is possible to play more than one Mountebank per turn on average. Sculptor, Patron, Tactician, Vassal and Cultist fail this test, and rightly so in my opinion. That doesn't mean they're bad cards, but their village-like effects really only allow you to get extra value out of your one action per turn rather than giving you more than one action per turn. Whether Lackeys meets my definition is marginal, but I think this card at best marginally deserves to be called a village. Of course it's great to be able to get a Villager when you need it, and it definitely can help you avoid terminal collision in a deck that's not trying to play a lot of actions every turn, but even if there's a way to trash the Lackeys you'd be hard-pressed to use this card as your only village in a deck that wants to play more than one terminal per turn at all consistently. Many of your points are addressed in this reference on villages: -- there's even a section specifically on Cultist/Vassal/Conspirator as not being villages (I never thought to include Bard/Sacred Grove though). It seems like your substitution of "Mountebank" for "terminal action" is internally consistent and not really different from what I consider a village. The other thing you would change would exclude cards that allow you to "bank" actions without changing the number of terminal actions you're playing overall (I assume you could Patron as a terminal action on a given turn if you're banking the villager, which is a fair assumption). The link will classify these villages as having limitations, and yes this is a severe limitation, but lots of different villages have lots of different limitations and while you can make an argument for including or excluding villages with certain types of limitations, I don't believe it's the definition's job to do that. I think the definition should be all-inclusive and then invite the reader/listener to judge whether or not those restrictions or limitations are severe enough that the village is or isn't useful given the context of a real game of Dominion. So yes, a lot of times Tactician or Patron won't be good enough, except for when it is. I've played decks where both of them were good enough as a village that I could use them to good effect: Patron worked well enough as support for a megaturn deck while Tactician enabled me to play non-terminals on my turn after playing a terminal action, which was important (that deck was really weird, I think I needed to terminally gain an Estate, then Rebuild it twice, all in a double-Tac shell. Does that mean your definition is worse or better than mine? I don't necessarily think so. But that's the reason why I like mine more I guess. I've seen a lot of people think there's no village on a board where the village there is good enough to work, and then they don't go for the best deck and lose because of it, so I prefer to guide people away from limiting themselves that way. Clearly I should have read your village article first! That all makes a lot of sense and I think you've convinced me. I just use Mountebank to avoid having to define what I mean by terminal, but your treatment is equivalent and probably more intuitive. I like the idea that Cultist etc. have a terminal and a non-terminal mode, and that seems like a good way round the paradox that if they’re terminal then they’re also villages. The other point was more minor, and for sure there’s no right or wrong answer. I guess the reason I use my definition is that when I’m looking for a village it’s usually because I want to build a deck that plays several terminals every turn. About 99% of decks that require a village in order to work are not going to viable if the only village is Patron or Tactician. Still, there are edge cases like the ones you mentioned above, plus being able to bank your action with Patron or picking up the odd Villager token by gaining Lackeys can allow you to risk a slightly higher density of terminals in a money or slog kind of deck. In the last case, the presence of a village isn’t enabling a completely different type of deck that wouldn’t be feasible without a village, but it’s a consideration nonetheless. Post Reply: Dominion: What does it mean?